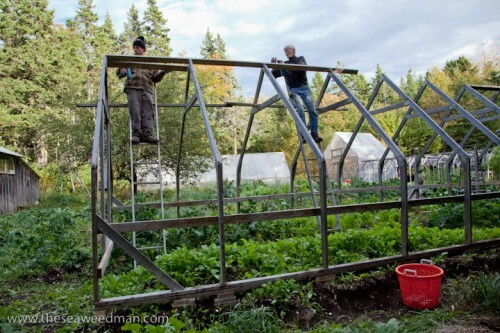 Some apprentices showed up in early fall and we framed up a new greenhouse. 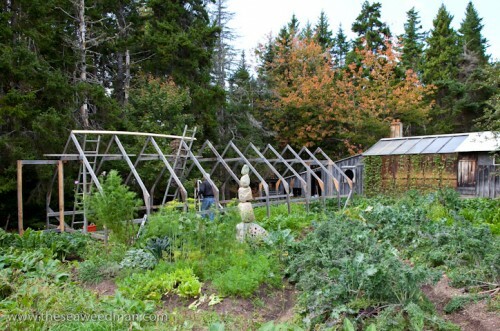 The greenhouse is forty feet long, eleven feet wide. I’m totally happy with the way it turned out. 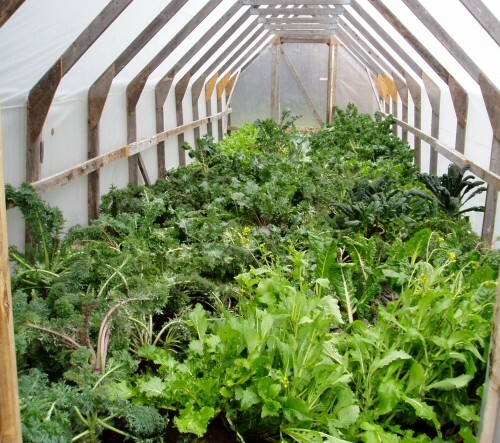 An unheated greenhouse gives me the climate of New Jersey. The greens will freeze, but kale roots stay alive, and in the spring they will grow new tops (I intend to snap off frozen leaves and eat steamed greens all winter long), and in March and April I’ll be eating the new shoots. Stay tuned, and I’ll post some photos as the process continues. Here’s a close-up. 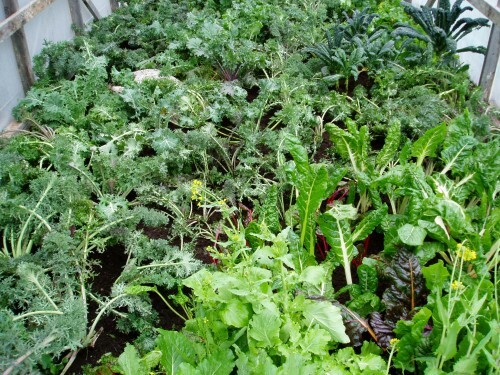 There are varieties of mustard, kale, and swiss chard included in this collection. Most of these plants have been transplanted from the garden. We’ve had a lot of rain, so the soil and the roots are very wet, and that means less transplanting shock. I trim the tops back when I transplant, to balance the temporary shock to the root systems caused by transplanting. The weather is cool, so there is no wilting. This photo was taken the same day I transplanted! My garden soil is primarily composed of composted seaweed, so these plants are extremely well-nourished and resistant to stress. Wall-to-wall kale, mustard, swiss chard.